In pursuit of his passion for art, Francesco moved to Rome, a city that inspired him and where he began to live his life as a painter. At the same time he was studying architecture, sociology and industrial design at La Sapienza University of Rome.Francesco was drawn to the study of chromotherapy. Fascinated by its potential to heal people through its ideology of balancing physical, emotional, spiritual and mental energy through the use of color and light, he allowed these reflections on color therapy to permeate his technical and creative approach to painting. In 1998 he travelled to Baslow in Derbyshire, England to learn the English language. Moved by the local landscapes, Francesco explored working in watercolor. Upon his return to Rome, Francesco's entrepreneurial spirit took hold and he opened a Bed and Breakfast. The Paolo ll B & B proved to be an invaluable experience and contributed significantly to Francesco's painting due to his close contact with people from around the globe. With this experience, he gained insight into various cultures. His artwork was a central focus at the B & B and the reactions to his paintings from his diverse clientele were a source of inspiration for him. He considered seriously the critiques and discussions of his work from the various guests at the B & B and this encouraged him to continue on his path, confirming his beliefs in color therapy. In 2007 Francesco began participating in important art exhibitions in Italy, including the Municipality of Genzano in the Province of Rome. 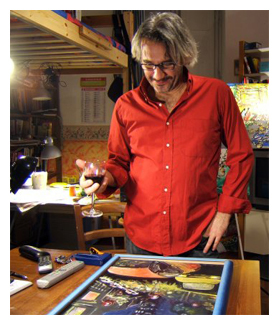 He gained acclaimed recognition by art critics, among them, Susanna Rossi Esser.During his many travels abroad, Francesco has always returned to Montreal, a city that he discovered in the early 90's. The vibrancy of Montreal, its people, its melting pot of culture and the close friendships he has cultivated over the years has brought out his true energy for contemporary painting. His love for Montreal has had an immense influence on his art. Today, Francesco devotes all his time to painting. He shares his life between the two cities that fulfill both his personal and artistic goals. Rome - Montreal.